I had brunch with some friends last week at Cafe Krummel in Kaiserslautern. 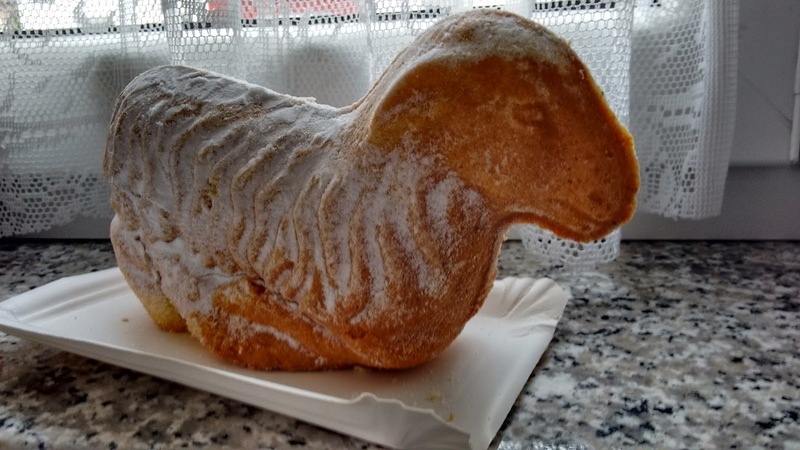 As I was paying for my meal, I saw a traditional German baked good, in the shape of an Easter lamb. I was curious what it was made of; I wanted to try it. I had been speaking German to settle my bill but couldn't think of how to ask what it was filled with. My German friends with me, D and Cl., were cute; they chimed in and asked about it in German. I was trying to pay, order, and concentrate, so all I heard was "lamm" and giggling as an answer. C had apparently asked what the Easter camel was filled with. The clerk told her lamb. I selected one and as we were leaving, I asked what I had missed, giggling too when I realized that Cl. had called it a camel and not a lamb, and it was not filled with any kind of meat. At 8 euros, it was quite expensive baby "lambel." I told my coworker this story and it made us wonder: what do baby camels look like? Was C way off? Apparently she wasn't! According to Professor Google, baby camels' humps don't immediately stand up so the Easter lamb pasty could have very well have been an Easter camel baby. The most important thing? The baby whatever-it-was tasted good; it was like the lovechild of a doughnut and cake, with a vanilla-y taste.